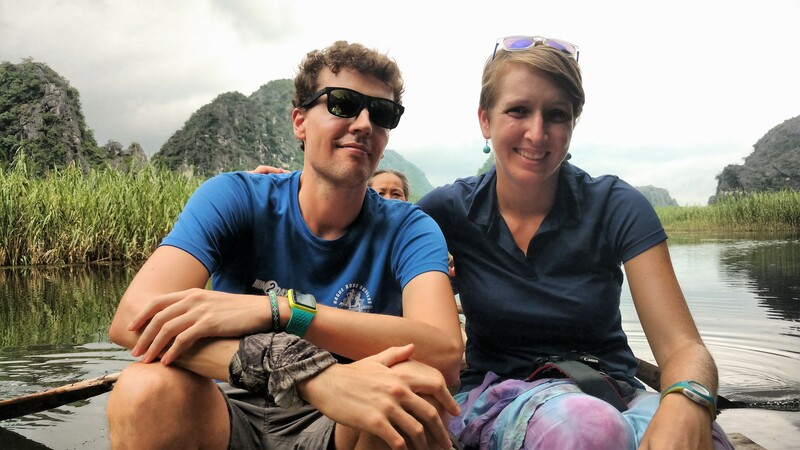 Welcome to part two of my impressions of northern Vietnam (for part one click here). For twelve days Sophie and I toured Vietnam’s land of mountains, rice terraces and ethnic minority life. 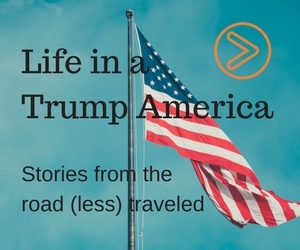 These are my personal day-to-day insights from the second leg of our trip. We leave Phu Yen to go back on the road towards Mai Chau. An hour into the drive we are stopped. Further up the road a bridge has collapsed. It’s been raining a lot the past few days and the water swell must have given it the last nudge. I check Google Maps and quickly realize this means a major detour. Driver Ming confirms. Almost our detour gets longer when we get to a bend in the road where a small landslide has made it difficult for cars to pass by. It’s one-way traffic. After a long wait, it’s our turn and we slowly go through the bend and continue our journey. Ming drives carefully because animals – dogs, buffalo, goats, ducks, geese – can cross the road at any time. After a total driving time of about six hours we reach our destination. 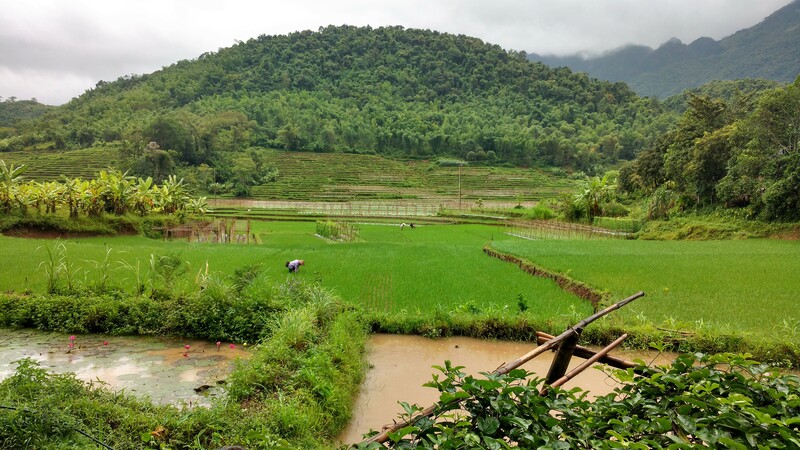 The view from the ground floor of our homestay in Mai Chau. Mai Chau is predominantly White Thai. The owner of our homestay also belongs to this ethnic minority. He has 2,000 m2 of rice fields and, due to favorable weather conditions, can do two harvests per year. The views from the ground floor of the homestay where we can eat and relax are amazing. After dinner, our travel guide Asu tells me about how many members of his ethnic group, the Black Hmong, cooperated with the United States during the Vietnam War. The CIA trained Hmong tribesmen to fight against Communist insurgencies in Laos. According to Asu, the Americans promised them land in case the war was won or asylum in the U.S. in case it was lost. Only a few were actually granted asylum after the U.S. withdrew its troops. After the war there were several incidences of severe retribution against Black Hmong. In 2007 the U.S. indicted their former Black Hmong ally, general Vang Pao, as a terrorist. Day #8 – You only get one shot? After breakfast we go on a nice flat walk wearing our sandals. The vegetation is diverse. Sometimes Asu stops to point out plants with a medicinal use. Especially people living in remote areas rely on these to threat illnesses. Western medicine is too expensive for them and hospitals are usually too far away. Only in extreme cases will they venture out of their village to the city for medical care. In the afternoon we go on a very wet bike ride. Uncharacteristically, we share the streets with many other tourists who decided to do the same – regardless of the rain. Back at the homestay we meet two Spanish women from the Basque Country. We get on well and share travel stories. Boat tour in Van Long Nature Reserve. Parts of the King Kong movie Skull Island (2017) were shot here. Shortly after dinner the son of the house invites me to join him and his friends for some shots of rice wine. In the middle of the table there’s a big hotpot with some sort of dog meat stew. My vegan, dog-owning sister will kill me for this, but I did try a very small piece. In northern Vietnam dog is a very common dish. I didn’t dislike the taste, but the smell wasn’t all that. I think it’ll be a one-time thing. In the meantime everyone except me has taken of their shirt. The guys pour one shot after the other. The son is the only one in the group comfortable speaking English. He expresses many times his gratitude that we are visiting his village. He’s proud to share his White Thai culture. He’s never left northern Vietnam. I ask whether he envies all of these foreigners visiting his home. His answer hits a chord with me. He loves his community, he says. Everyone helps each other. When I’m not here and my family needs help, I know our neighbors will take care of them. From Mai Chau we drive to Ninh Binh. On the way we stop at Van Long Nature Reserve to take a little boat out on the lake. Asu mentions that parts of the latest King Kong movie, Skull Island (2017), were shot here. 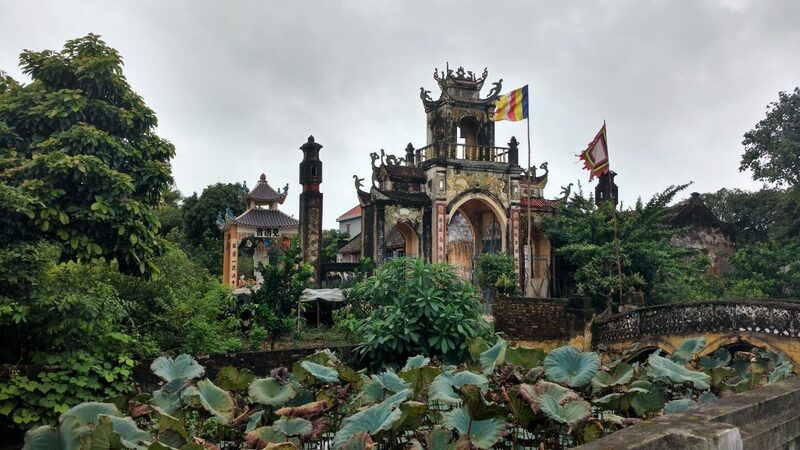 Buddhist temple around the corner from our homestay in Ninh Binh. It’s pretty much all Vietnamese, or as they are called in Vietnam, ‘Kinh’people, in this region. Kinh make up ninety percent of the population. The other ten percent is made up of fifty-three ethnic minorities. Our homestay for the next two nights belongs to the owner of Ethnic Travel and it doesn’t disappoint. Set in a residential area it looks more like a B&B. We do some much needed washing. But there’s no machine, though, hand wash only. A lot of work, but rewarding. Ducks and more ducks. We see ducks on our morning walk, our late morning boat ride, and our afternoon bike ride. And all against a stunning backdrop of the sharp and steep limestone rock formations this region is known for. 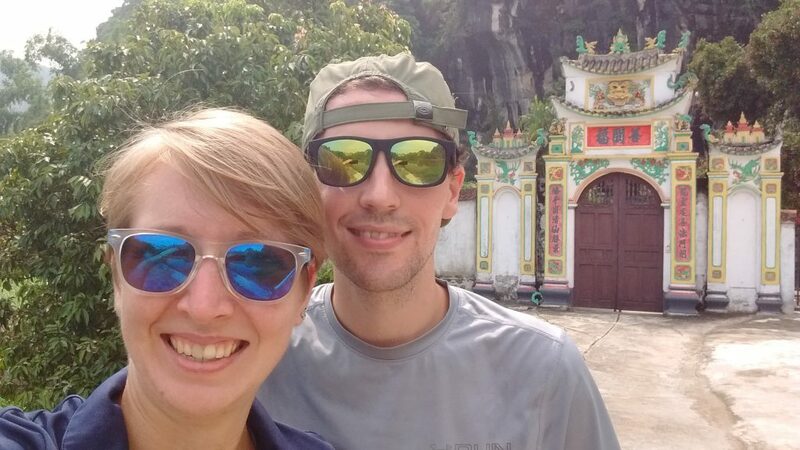 We stopped at this Buddhist temple during a bike ride in Ninh Binh. We were the only visitors. During the bike trip we make a stop at a Buddhist temple. We gently push open the big wooden door and enter the temple complex. We appear to be the only visitors. I go up some stairs to a small cave. Before entering I remove my slippers. Inside there are several shrines and lots and lots of offerings. They vary from (fake) money bills and bottles of water to boxes of cookies and flowers. 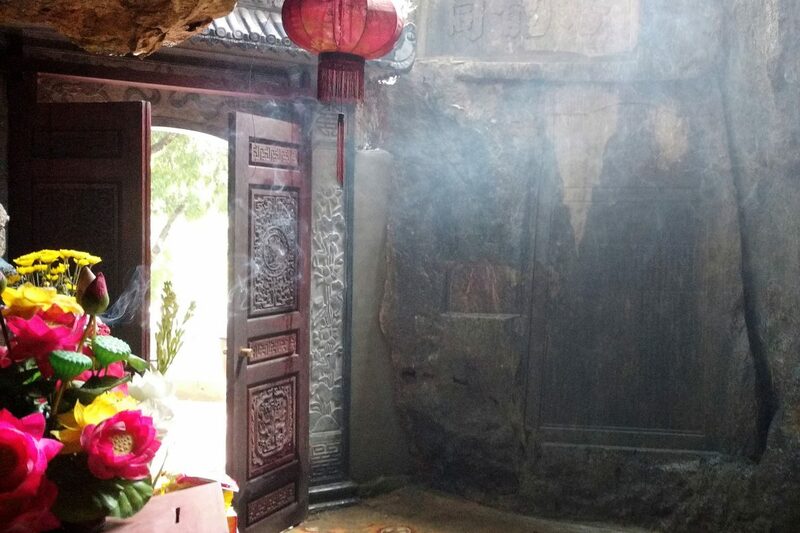 An eerie fog caused by the burning of incense sticks gently drifts through the cave. 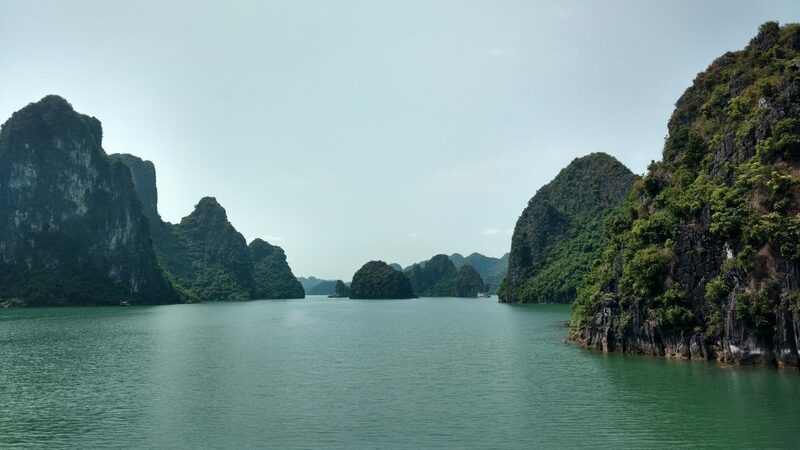 Today we drive from Ninh Binh to a part of Vietnam that draws millions of people from all over the world: Halong Bay. It takes about four hours to reach the port. There’s a lot of construction going on and many resorts and amusement parks have set up shop here. After about twenty minutes of driving through the port area we arrive at our boat. We’re in a group of about fourteen people when we set off to roam around Halong Bay. Two times the boat stops for us to do some kayaking. In the evening we ‘park’ in a small bay. Many other boats have likewise decided to camp out here for the night. The quintessential Halong Bay view. Asu and I sit on the upper deck, have a few beers, and he tells me about some of his future plans. He wants to start his own travel, work and study agency, specifically focused on Hmong culture, the tribe he belongs to. Together we brainstorm good company names. ‘Hmong Secrets’ gets floated, but we settle on ‘Hmong Legends’. Asu grew up in a small rural community in northern Vietnam. His mother passed away when he was still young. The farming life was not for him, so he decided to move to Hanoi. There he would teach English during the day and work nights as a hotel receptionist. He was making about 200 U.S. dollars a month. The first six months were hard because he didn’t feel like he belonged. People would also comment on his accent in his spoken Vietnamese. Asu then found a job as a tour guide in Ho Chi Minh city. A year and a half ago he switched to Ethnic Travel where he now works a freelance tour guide, making about fifteen to twenty dollars a day. 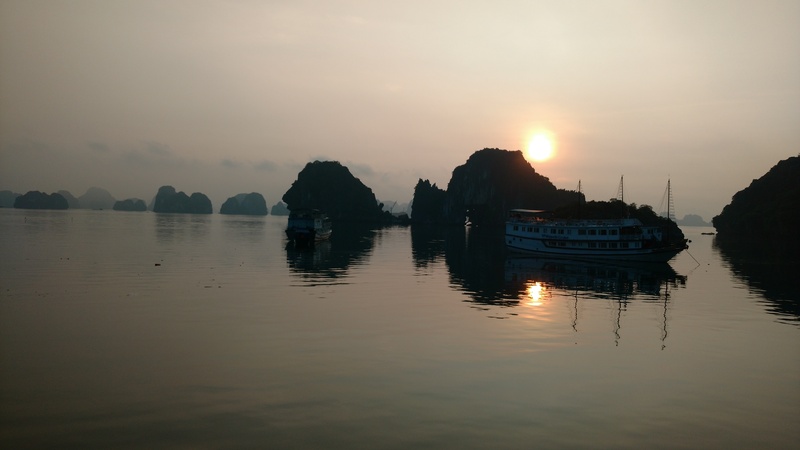 Watching the sunrise in Halong Bay from the upper deck of our boat. Asu is taking an online university course in English. He wants to do a master degree after that and maybe work as a teacher. At age thirty or thirty-five he wants to move back to his village, get married, build a house, and have a family. But not before he’s done enjoying city life, developing news skills, and maybe even studying abroad. I give Asu a few tips on speaking in front of groups, which he’s a little nervous about. We drink the last of the beer left in our bottles and say goodnight. The Spanish, Peruvian and Mexican guys on our boat are playing the card game ‘Uno’. They’re joined by two French girls. Not before long it turns into a drinking game. I decide to go to our room where Sophie is jotting down her impressions of today. The sea is calm. More kayaking after breakfast. Then it’s back to the mainland, into a minivan and off to board another boat that will take us to Bai Tu Long bay. It’s clear right away that it’s nowhere near as touristy as Halong Bay. We set course for the island of Dao Quan Lan where we’ll stay overnight in a homestay. When we arrive at the island, we transfer to bikes. After about ten minutes we stop at a deserted beach and rush into the water. It’s getting close to sundown so we can’t stay long. After an hour we get back on the bikes and cycle to the homestay which looks more like a hotel. This will be the last day before we return to Hanoi. In the morning an eco-friendly tuck tuck transports us back to the boat. We sail back to the main port and get into the minivan headed for Hanoi. We arrive there in the early evening. We’re staying in the same hotel, but this time in their huge suite. We spend most of the evening in bed eating snacks and watching television. The next day we hit a few of the touristy spots. 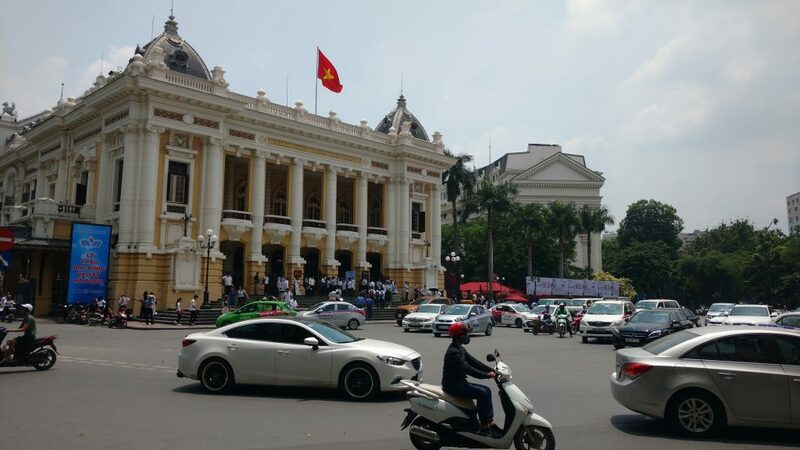 Sophie visits the Vietnamese Women’s Museum and I go to the Vietnamese National Museum of History. In the latter’s main building it’s all about ancient history. Interesting, sure, but I want to learn more about Vietnam’s modern history, especially the revolution against the French and the war against the Americans. Those exhibits are in a separate building across the street in what used to be the Museum of the Revolution. Impression of Hanoi city center’s museum district. I love this kind of stuff. Newspaper clippings, photographs, books; it all gives me a perspective on historical matters that you just that don’t get if you don’t come here. And although some of the exhibits are mocking, cynical and critical in how they describe the role of the French and the Americans in shaping (modern) Vietnamese history, I don’t find the museum to have an explicit anti-French or anti-American bias. The focus is really on what as a nation Vietnam views to be its successes in resistance, in reclaiming and reuniting their country. It’s clear Vietnam doesn’t want to be cast a victim of colonial power play. We do some souvenir shopping and I have a delicious iced Vietnamese egg coffee which reminds me a bit of tiramisu. We grab a bahn mi sandwich to hold us over until dinner. Later, on the way to the restaurant, we stop at one of Hanoi’s famous fresh beer joints. Basically a Vietnamese version of a beer garden. The beer’s on tap, which I love and can’t find almost anywhere in Davao, and it’s an unbelievable mere thirty euro cents per glass. Oh yeah, that includes free peanuts. 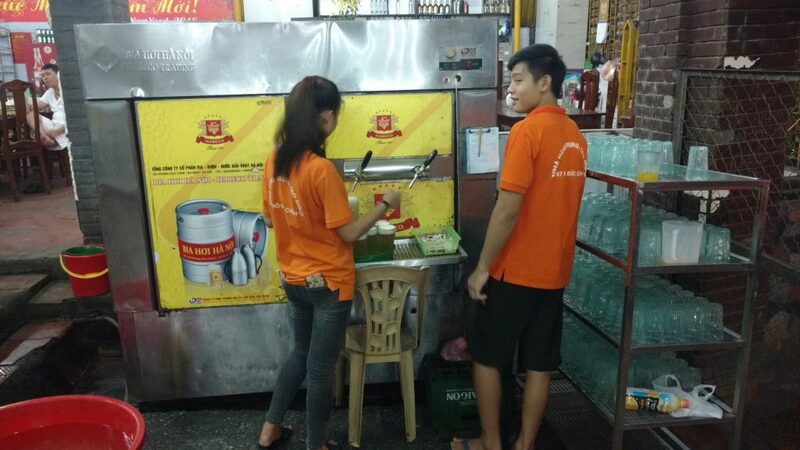 One of Hanoi’s many fresh beer bars. A beer costs only 30 euro cents. At 10 pm we drive from the hotel back to the airport. Exactly the same way as two weeks ago. It will be a sleepless night as our plane leaves at 1 am and I don’t sleep on planes. But it’s okay. Sleep can wait. And when it comes, I hope I dream about mountains, rice fields and the countless shades of green that are a constant in Vietnam’s many magical landscapes. It was a great trip. Cảm ơn, Việt Nam. Yes I will kill you! Je hebt hond gegeten? Vreselijk! Foei! Ik zeg het tegen Josje!! Maar verder..wat een ongelofelijke reis. Wauw! Zo divers, zo anders dan wat we/je gewend bent. Wat mooi de tempel waar jullie alleen waren. Een reis om nooit te vergeten.